West Coast Life celebrates the intriguing concept of wild flowers in Langebaan and surrounding areas! To increase fuller awareness, West Coast Life coordinates a photographic competition in August and September in conjunction with Weslander, local newspaper in the West Coast of South Africa. 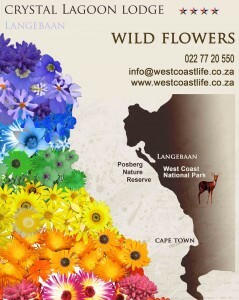 Send your wild flower pictures not larger than 3MB to venues@westcoastlife.co.za. Remember to rename your pictures with your name and surname, and should you send in more than one picture, the number of each picture. Ownership of participating photos are shared by photographers and competition coordinators.